This elephant is helping him get stronger! It's no elephant, but it's just as fun! After seeing how well Noah did on the inflatable elephant the last time he used it, I really wanted to get him one to use at home. The one used by the physical therapists is very expensive since it has to be purchased from a medical supply company. 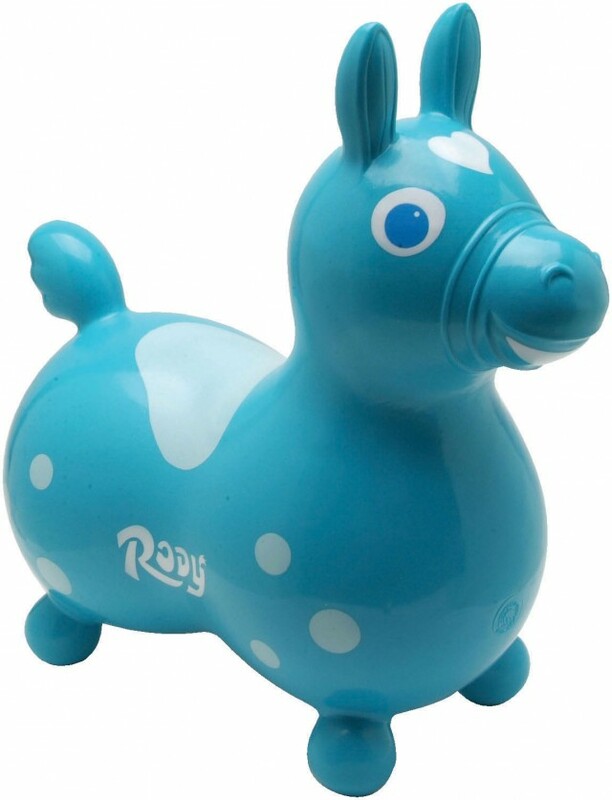 However, after talking with some other families who have children born with down syndrome I found out about the Rody Inflatable Hopping Horse. The word “inflatable” threw me off since the one used at the physical therapist office seemed to be made of a really hard plastic, and not “inflatable.” But, after looking closer at the one used by the therapists, it actually is inflatable. (It sort of reminds me of those big rubber balls you can sit on and ride. It’s not like a balloon or anything.) The price is much cheaper on amazon, and looks to be the same quality as the more expensive version. I ordered one today, and will post a review after we get a chance to use it. This looks like a great, fun, and fairly inexpensive tool for anyone who wants to help their baby develop some core strength. He gets cuter (and stronger) by the day. He makes working out look good...! the horse looks really cool, added to my ‘wishlist’. since we have some time, will wait on your review. 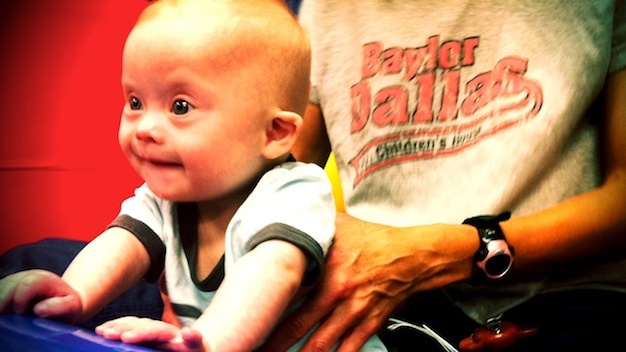 since we have lots of older children that pass through – would love to know what the age/weight restrictions are. Chastity, I’ll be sure to let you know more when it arrives. I plan on doing a video review of it so be sure to check back. My son also has DS (he’s 17 months now) and we also have a Rody. It’s great for building trunk strength and is just plain fun. The smaller one (like in the pic) is supposed to hold up to 250 lbs or some crazy number like that. And I can tell you that, although I didn’t fit on it well, it held my 150lbs just fine. We’ve had several older kids (up to 10yo) to our house and they have all liked playing with it and riding it. Our dog was a little nervous around it at first, but she doesn’t mind it now. 🙂 I hope you guys get a lot of use out of yours. That’s awesome! I can’t believe this little thing holds that much weight. I’d never thought. The physical therapist sure does like them though. I’d love to see pictures / videos of Dane having some fun! Do you guys have a blog or anything? I’m glad you came by and commented. Joseph, thanks so much! We really appreciate the kind, and encouraging words! Your photos are awesome. 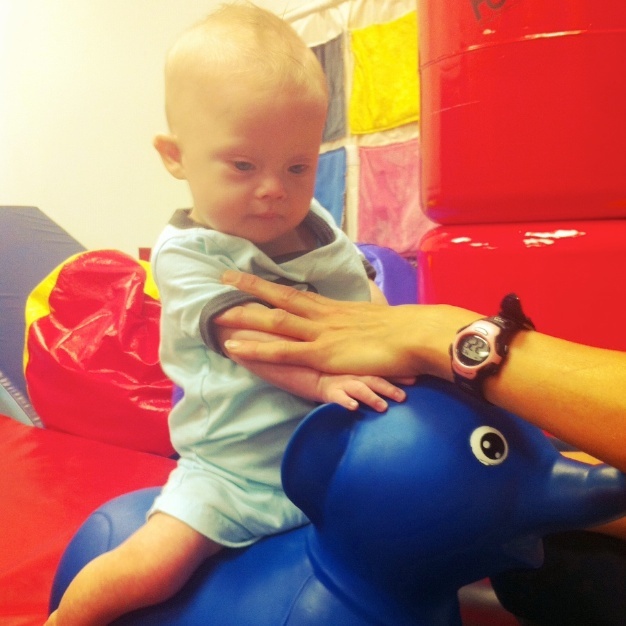 Makes me so proud to be a pediatric physical therapist when I see how excited you are about Noah’s progress.